Stanford University psychologist Carol Dweck has done numerous studies on how mindset affects achievement in children. The results showed that those with a fixed mindset perform more poorly than those with a growth mindset. However, not all students know how to change their mindset or even that intelligence is not a fixed thing that they cannot grow from. To boost student achievement, teaching growth mindset is invaluable as a resource for learning. With a growth mindset, students see their qualities as changeable through hard work and dedication. Those with a fixed mindset believe that no matter what they do, they cannot change their intelligence. With a growth mindset, students believe that, no matter the subject, they can persevere by working a little harder (sometimes a lot harder). How Can I Help Students Develop a Growth Mindset? When students have a fixed mindset, it’s hard to get them to learn beyond where they’re at. For this reason, it’s important to understand that not only are academic traits changeable, but so are our attitudes toward ourselves. 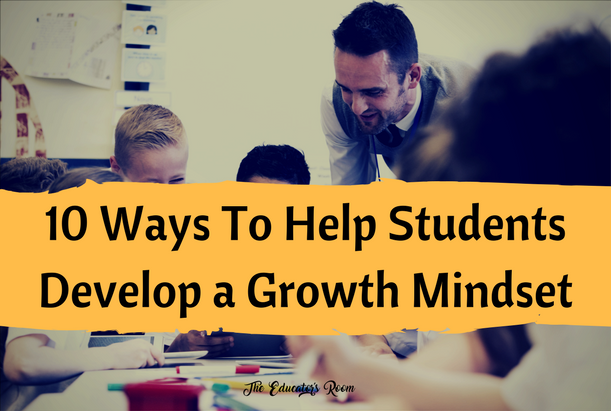 Here are just a few ways to help students develop a growth mindset. Embrace mistakes as a part of learning – failing to acknowledge that we make mistakes as human beings makes it hard to learn from them. Teach students about brain plasticity – if students don’t know that the brain is a flexible muscle capable of molding and changing, they should learn about the possibilities for growth through brain plasticity. There’s a great video here. Use the power of “yet” in the classroom – Let students know that not knowing is temporary. If they don’t get how to do something, be sure to intentionally use the word “yet” so that they know that they can reach their goals, even if they aren’t there yet. Give students a sense of purpose. Dweck’s research said that growth mindset came with a greater sense of purpose, so help students develop a purpose by giving them specific, achievable goals, or, better yet having them come up with their own. Give praise more for growth than speed. Some students need longer to process information. Value their growth toward goals rather than the speed with which they attain them. Failure is an ugly word. Help students see failure as something else. Call it something entirely different like having “room for improvement” rather than failure. Once they fail, it’s hard to continue. Having room for improvement allows for…well…improvement. Reward hard work, not talent. All students need to feel important, not just the ones who are more quickly adept at learning a process. Value hard work, not just raw talent. This should help both the struggling learners and the accelerated learners to make greater strides. Have students learn from each other’s mistakes. My favorite mistake is a great thing to bring into the classroom. Pick a mistake a student has made and showcase it. Have students analyze the mistake and learn from it and make mistakes something students learn from rather than dread. Give students ownership of their own attitudes. Once students learn to develop a growth mindset they should own it. Allow them to own their attitudes and their mindsets. They have a great future ahead. Let them take charge of it.